HORSE PARASITES. Summary of the most common external and internal parasites of HORSES: flies, lice, mites, ticks, roundworms, tapeworms, flukes, etc. This article offers a summary of the most common parasites of horses, both external (ectoparasites) and internal (helminths) parasites. «H» to «HHHHH» indicates how harmful they are for horses. The more H, the more harmful. Black flies, gnats. H-F-R. Local problem in endemic regions, worldwide. Horn flies. H-FF-RRR. Usually a secondary problem for horses, worldwide. Midges. H-F. Local problem in endemic regions, worldwide. Mosquitoes. HH-FFF-RRR. A worldwide problem in all kind of domestic animals, but usually not the major issue. Stable flies. 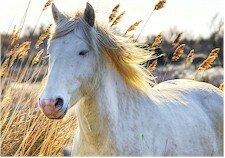 HH-F-R. Can be a significant problem in horses, both outdoors and indoors, particularly by warm and humid weather. Worldwide. Tsetse flies. HHH-FF. A tremendous problem in Africa in horses and all livestock kept outdoors. Horseflies. HH-FF. Usually not the biggest issue; mainly outdoors by warm weather, worldwide. Horse louse flies. H-F. Mostly not a big issue. Houseflies. H-FFFF-RRRRR. Can be a serious problem in dairy operations and feedlots worldwide, mainly during the warm and humid season. Filth & nuisance flies. H-FF. Usually a secondary issue in dairy and feedlot operations in the warm and humid season. Lice. H-FF-R. Very common problem worldwide, mainly in indoor operations, particularly during the cold season in regions with temperate climate. Human bot flies, Dermatobia. HHH-FF. A serious problem in many regions of Central and South America. Screwworm flies. HHH-FF. A serious threat for all horses outdoors in endemic regions in tropical and subtropical countries where it has not been yet eradicated. Horse bot flies. HHH-FF. A serious threat worldwide, particularly for young foals. Horse mites. H-F. A problem worldwide in all kind of horses, mainly in indoors, particularly during the cold season in regions with temperate climate. Horse ticks. HHH-FFF. A worldwide problem, mainly outdoors, particularly in tropical and subtropical regions in cattle horses. Amblyomma spp. HH-FFF. A serious problem for horses in tropical and subtropical regions, mainly in Latin America and Africa. Boophilus spp, cattle ticks. HH-FFF-RRRR. Number one tick problem for all cattle in Latin America, Australia and parts of Africa, mostly not a big issue for horses. Dermacentor spp. HH-FF. An important tick for horses in tropical and subtropical America. Haemaphysalis spp. HH-FF. Usually a secondary problem for horses in parts of Asia, Africa and Europe. Hyalomma spp. HH-FFF. Can be a serious problem in some regions in Asia and Europe. Ixodes spp. HH-FF. Usually a minor problem for horses, although tick paralysis caused by Ixodes holocyclus is an increasing problem in horses Australia. Rhipicephalus spp. HH-FFF. A serious problem for horses in tropical and subtropical regions in Africa. Cyathostomins. Small strongyles. HHHH-FFFF-RRRR. Large intestine. Currently number one worm problem in horses worldwide. Mostly in mixed infections. Gongylonema pulchrum. H-F. Esophagus. Mostly a secondary issue. Worldwide. Habronema spp. HH-FFF. Stomach. Can be regionally quite important. Found worldwide. Oxyuris equi. H-FF. Large intestine. Usually not a major problem for horses. Strongyloides westeri. HHH-FFF. Small intestine. A serious threat for young foals, mainly in warm and moist regions, worldwide. Strongylus spp. Large strongyles. HHHH-FFFF. Large intestine. One of the most harmful parasites of horses. Mostly in mixed infections. Parascaris equorum. HHH-FFF-RR. Small intestine. A serious problem worldwide, particularly for young animals. Trichostrongylus axei. HHH-FFF. Stomach and small intestine. A serious problem worldwide, particularly for young animals. Dictyocaulus arnfieldi. HHH-FFF. Lungworms. A serious problem worldwide, particularly for young animals, mainly in regions with temperate and cold climate. Onchocerca spp. H-F. Various organs. Worldwide, different species, usually a secondary issue. Parafilaria multipapillosa. H-F. Skin. Worldwide, mainly Europe, Africa, Asia. Setaria equina. H-F. Peritoneal cavity. Usually a minor problem. Worldwide. Thelazia lacrymalis. H-FF. In and around the eyes. Worldwide, normally a minor issue. Dicrocoelium spp. H-F. Lancet fluke. Bile ducts and gallbladder. Occasionally found in horses. Fasciola hepatica. H-F-RR. Common liver fluke. Biliary ducts and gallbladder. Normally a secondary problem for horses. Fasciola gigantica. H-F. Tropical liver fluke. Liver tissue, biliary ducts and gallbladder. Normally a secondary problem for horses. Gastrodiscus aegyptiacus. H-F. Equine intestinal fluke. Colon and small intestine. Found in Africa and India. Usually not a serious problem. Schistosoma spp. H-FF. Blood flukes. Blood vessels. Usually a minor issue in parts of Asia and Africa. Anoplocephala spp. H-F. Small intestine, ileocaecal-valve. Worldwide. Usually not the first priority. Cysticercus tenuicollis. H-F. Abdominal organs. Worldwide, usually a minor issue. Echinococcus granulosus. H-F. Hydatid worm. Various organs. Worldwide, usually a secondary issue in cattle. Paranoplocephala spp. H-F. Small intestine. Worldwide. Usually not the first priority.